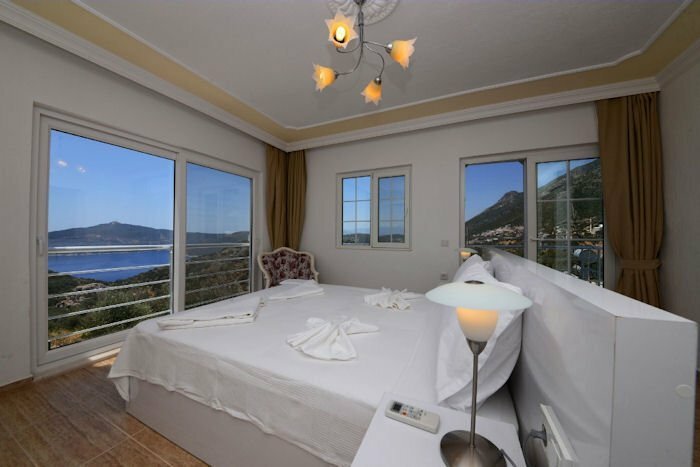 Villa Kalkan Dream is a brand new, luxury home, located in an elevated position offering spectacular views of Kalkan and the Bay and pleasant breezes during the hottest summer months. Villa Kalkan Dream is a brand new, luxury home, located in an elevated position offering spectacular views of Kalkan and the Bay and pleasant breezes during the hottest summer months. Perfect for families and larger groups alike. The gardens and pool terrace have fabulous views of Kalkan Bay and the open sea, making this a perfect villa for those who love their outside space. The villa has a modern open plan design and interior decoration lend a look and spacious atmosphere to the villa. Kalkan town is accessible by a two minute drive and its only 5 minutes walk to the nearest shop and green grocery. This spacious villa is sleeps up to 12 people. Built over three floors with six luxury bedrooms, two of which are en-suite and the others have jack and jill en-suites (two bedrooms share one en-suite). The garden and pool have fabulous views of the bay and open sea below them. There is also a chill-out area to the rear of the property which offers mountain views. The villa has full air-conditioning. This superb Holiday Rental Villa in Kalkan with its heavenly views and is just a two minutes driving distance to the shops, green grocery, town, restaurants and sea at Kalkan.